Click on the Act Blue button above to get started. We've improved access, security, and safety for your donation with Act Blue, a giving platform used by thousands of Democratic organizations and candidates. 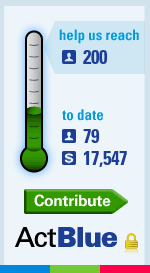 Start your Monthly Donation by clicking here, or the Act Blue logo above. Once you've started it, a monthly donation automatically transfers from your bank account to ours. It's set it and forget it. And what seems small - $10, $25, or $50 a month - by the end of the year is a sizable investment in our organization. Of course, one-time contributions of any amount are gladly accepted as well. After your transaction, you'll receive a message from Act Blue with instructions to stop and restart your pledge at any time. If you have any questions, please email us at donate@clarkcountydems.org. Thank you to all of our Monthly Donors!